BEIJING – Singapore and China have launched two new projects to expand Chongqing’s transport links to Southeast Asia and Central Asia. The CCI is Singapore and China’s third joint project, started in November 2015, after Suzhou Industrial Park and Tianjin Eco-City. It aims to help drive growth in China’s less developed western region by improving Chongqing’s transport and services links to the region and beyond. “The two projects raise Chongqing’s status as a key inland logistics hub for western China, and also contribute to China’s Belt and Road initiative,” said Mr Lee Ark Boon, chief executive of International Enterprise Singapore, the agency facilitating commercial projects from the CCI office. “We hope that the two projects will serve as a model for future cooperation and play a leading role in spearheading other similar projects,” said Mr Tang Zongwei, chairman of the Chongqing Liangjiang New Area Development and Investment Group. The company is participating in both projects together with other Singapore and Chongqing players. “It is also notable that the projects bring together leading players in both Singapore and Chongqing, who would otherwise be competitors (in the transport and logistics industry),” said Mr Teo, who is also chairman of the Singapore Business Federation and industry adviser to the CCI. 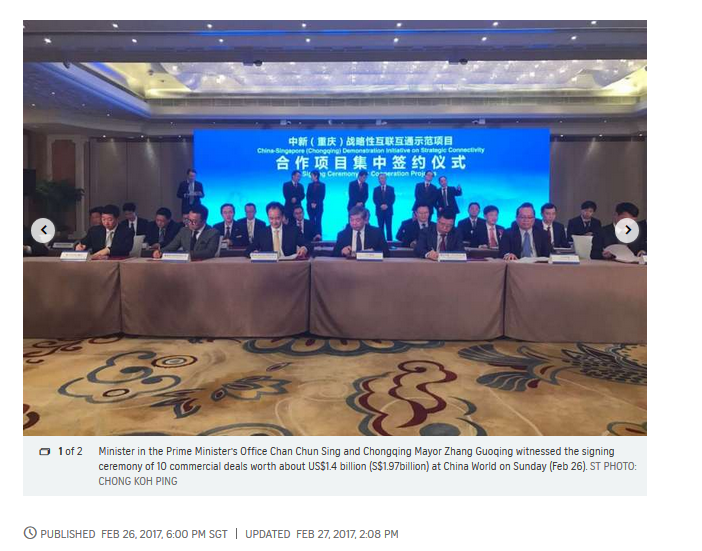 On Sunday, Minister in the Prime Minister’s Office Chan Chun Sing and Chongqing Mayor Zhang Guoqing witnessed the signing ceremony of the 10 projects at a hotel in Beijing.